When exactly people started forcing flowerbulbs on glass vases is not exactly known, but it probably dates back to about 1700, or perhaps even earlier. In 17th century Holland the tulip enjoyed immense popularity and for some time this led to astronomic prices for tulip bulbs, the so called Tulipmania. Hyacinths were cultivated at the same time but became really fashionable in the 18th century, taking over the dominant position the tulip had before. Fellow collector Gjalt Welling researched the history of forcing bulbs on glass vases and presented a lecture on the subject. (Bloembollenglazenclub, Ledenbericht 28, September 2011, appendix 1). The first publication with pictures of bulbs on vases he could find was by the Swedish scientist Martin Triewald (Philosofical Transactions 37, 1731-32). 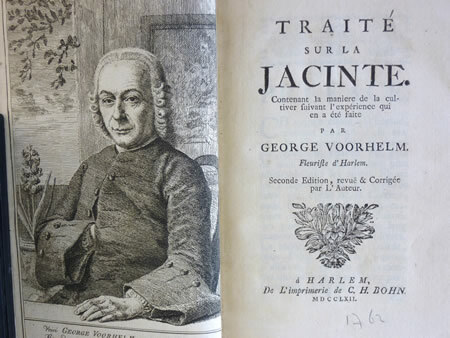 In 1750 Grotjan, also from Germany, published his experiments about forcing hyacinths on water in winter. Then in 1752 the famous bulbgrower Voorhelm, from Haarlem, Holland, published in 'Traité sur la Jacinthe' a nice drawing of a double hyacinth forced on glass. This publication was especially intended for French customers to increase knowledge of the hyacinth for use in the garden and home. In Krelage's book 'Drie eeuwen Bloembollenexport' (Three centuries of flower bulb export), 1946, we can read that Madame de Pompadour, mistress of Louis XV, king of France played an important part in hyacinth culture. She had a great love for flowers, including hyacinths. The French court bought every year many hyacinths from bulb growers of Haarlem. In 1759, 363 hyacinths were ordered for beds and 200 for glasses in the winter. The hyacinth remained a very popular flower bulb until the end of the 20th century. Then it slowly lost its dominant position and daffodils and tulips gained popularity. The forcing of bulbs on water remained a popular way of having spring flowers indoors in the cold and dark winter period, specially in the northern and western parts of Europe and the United States, with the hyacinth being the most important bulb by far. During the dark winters with no other supply of flowers, those produced from bulbs were most welcome. In the 20th century, the numbers of hyacinths used for forcing indoors increased over the years. 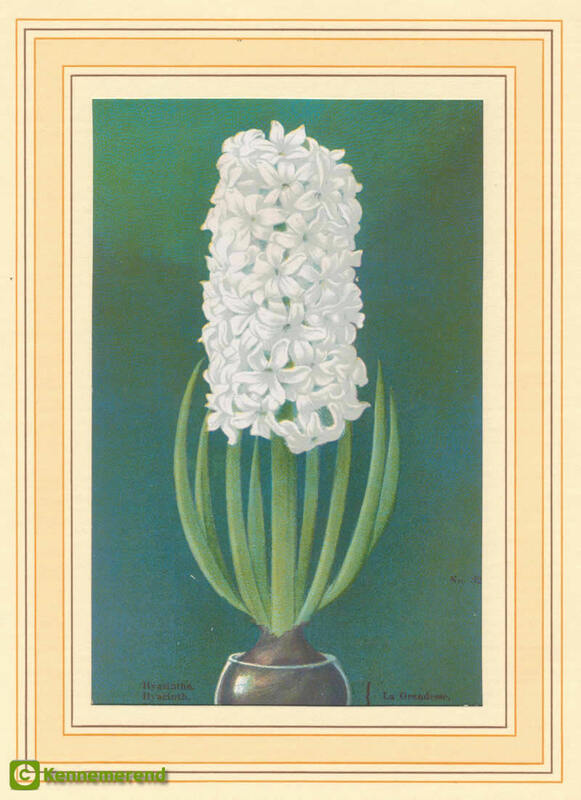 As prices of bulbs and vases became relatively low, the general public could also afford to force hyacinths at home. Before that, hyacinths had been expensive and grown only for use at court and by other well-to-do people. 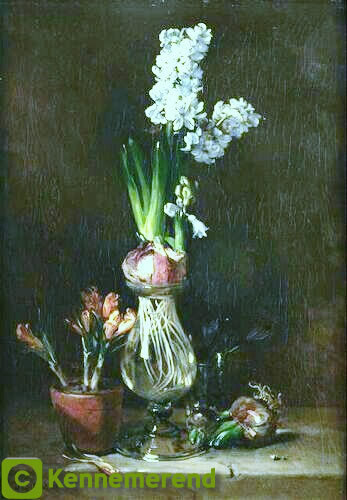 With the increase in the number of hyacinths and other bulbs forced at home, the production of bulb vases grew as well. Thousands of different types of bulb vases have been developed over the centuries, in all shapes and colours, reflecting changing artistic styles, from unique hand-made glasses to those industrially produced by the million. In the last decades of the 20th century the indoor forcing of hyacinths on water started to decline, the offer of ready-to-flower hyacinths on pots, the lack of a cool location in the house and the overwhelming diversity of imported flowers and plants being the main reasons. Because many people "instead of buying them ready for use" find pleasure in growing hyacinths themselves, there is an increasing interest again in this old way of indoor forcing. Throughout the centuries the hyacinth was by far the most important bulb to force on water. Tulips are rarely reported as being forced on water. The tazetta daffodils (Paperwhite) were also popular for water culture, just as in the 20th century were crocuses, Hippeastrums (Amaryllis) and some other flower bulbs. The latter are grown on water on specially designed vases adapted to their size. 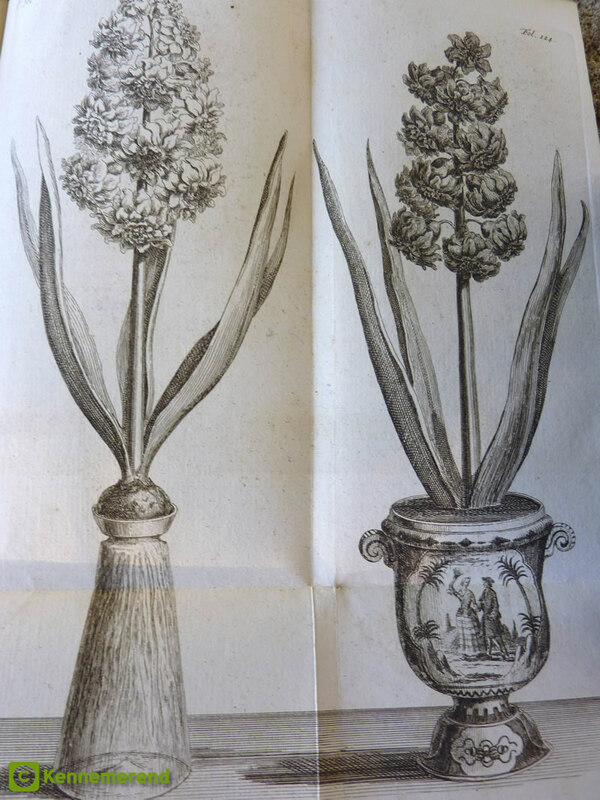 The famous Haarlem hyacinth grower, Voorhelm published an early picture of a nice double hyacinth, forced on a glass vase, in his 'Traité sur la jacinthe' (second edition 1762). A painting of Philippe Rousseau (1816-1887) of a vase with a hyacinth. Ca 1850, Museum Boymans-van Beuningen, Rotterdam. 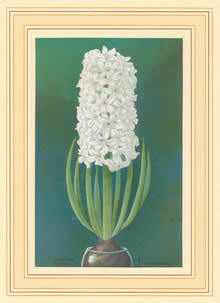 Unknown litho of a hyacinth on a glass vase of around 1900. Does anyone know the source?